I started focusing on proper training for this season’s sprint events less than 6 months before the district championships, and just a few weeks after surgery for a previously broken collarbone. I did already have general fitness from prior recreational road riding, a remote history of track racing over 25 years ago, and some unstructured general weight lifting. However, I am beyond pleased with how much progress I made, and the National-level results achieved, in a relatively short time. I attribute this progress largely to Lee Povey’s no-nonsense coaching approach with a consistent training dogma. Like anyone else with athletic training history, I previously made my own training decisions based on outdated principles and unfocused priorities before I began working with Lee. Furthermore, I am a physician with substantial training in physiology, such that I likely had more deeply-entrenched justifications of my prior training principles than most other athletes. Lee quickly identified this intellectual baggage and exercised both patience and resolve in prescribing my training program and answering my questions based on what is known to work. Furthermore, as a physician I make therapeutic decisions many times a day that are based on evidence-based research based on outcomes. While the published research on athletic training and performance outcomes is limited and has fundamentally different structure than medical research, I still appreciate that Lee keeps up with relevant reading and applies outcome-based principles in his program. Sprint race tactics were the ingredient I was lacking most when it came time for racing in June. The other important element was rest, which is always in short supply for all of us working athletes (that is, all of us!). I appreciated that Lee educated me through commentary on all my race performances from a tactical and behavioral point of view. In both the NCNCA district events (elite and masters) I was fairly unrested, saving the taper for nationals. I had ruined at least one prior national track championships in the distant past due to overtraining and lack of taper, so I was a bit anxious about tapering this year. Following my PCC program, my taper seemed flawless and I feel that I entered the master’s nationals in my best possible physical form. I am most pleased with my 2nd-seed 200 meter time, although my tactics were still wanting and will be a large part of next season’s training focus. 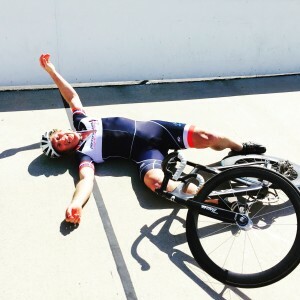 I dug extremely deep for the masters’ sprint event, and was simply not recovered two days later for the 500m TT. However, I felt near my peak again the following day and was quite happy with my performance as Man-2 in the team sprint, which I heard was the fastest 2nd lap for TS in my age group. Riding a bicycle has been an integral part of my life since I was very young. I don’t just mean that I learned to ride a bike early, which I didn’t. But since age 12 when I started in the early days of BMX (1972! ), I have considered the bicycle to be an indispensable extension of myself. Over the years I had a few periods of time when higher education and major life events have sidelined my bicycling, but my sense of identity as a cyclist has never left me. The type of bicycle I ride and the risks I take on two wheels have changed over the years, but I still get more satisfaction from this athletic endeavor than anything else. What competing on a track bike and training with Lee Povey means to me today is that I am truly investing in myself and exploring the most sophisticated application of myself to cycling. I don’t know how long I will ride down this particular road, but I certainly am liking where it is taking me.